The Mitsubishi MMR525 concept was Mitsubishi's entrant into the annual LA Auto Show Design Challenge. 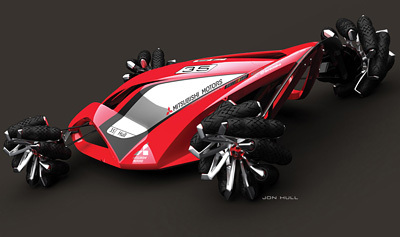 For 2008 the brief was to design a motorsport machine for the year 2025. 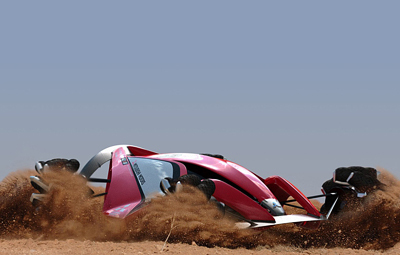 The Mitsubishi MMR525 Rally Racer concept is a wild and crazy off-road machine which looks like a cross between a futuristic dune buggy and a spacecraft. Of special note are the innovative multidirectional rollers mounted to the perimeter of the 'wheel' for increased traction and maneuverability. Dave O'Connell, Chief designer at Mitsubishi Motors R&D of America said of the MMR525 concept and design brief. 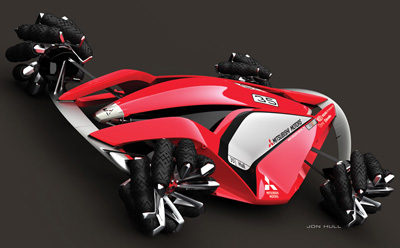 "This year's Motorsport 2025 project is just the sort of assignment the designers at Mitsubishi Motors dream of. It's rooted it the reality of automotive competition that our company is so successful at, but lets us look way out on the horizon as to where technology may take us. We all loved hearing the words, 'design a race car,' but really smiled when we learned it was a race car for the year 2025. That combined with linking the car to some of the fabulous racing heritage that's taken place here in California makes it indeed one of the most exciting projects we've ever worked on. 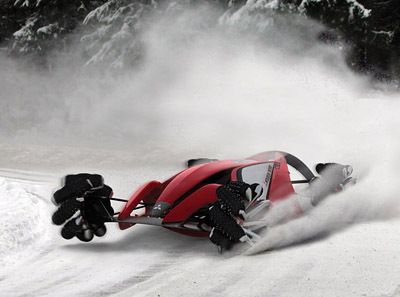 My dream would be to actually build and drive this car on the course it was designed for." 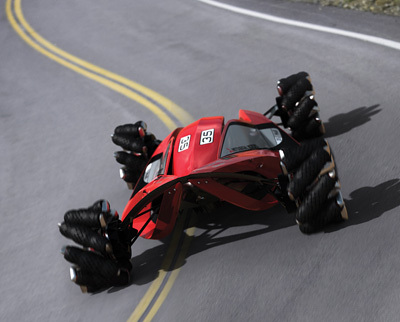 While the appearance of the Mitsubishi MMR525 concept is shocking, the multi-terrain, omnidirectional wheels consist of eight independently-controlled motors, allowing for "8 x 4" wheel drive so that the car can be driven forward while pointing in any direction. The MMR25 drives sideways into a corner and points the nose of the car outwards before even reaching the apex of the curve while driving sideways or backwards. 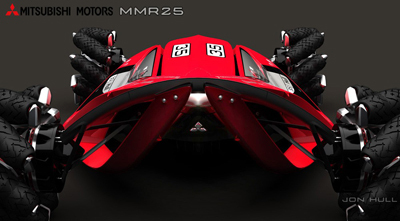 The Mitsubishi MMR25 also uses special Oblique Aerodynamics to give the vehicle aero advantages. The center wing acts as a spoiler, actuated by pneumatic and fabricated from Memory Metal Alloy while the front and rear spoilers double as suspension blades which are able to control stiffness and ride height.